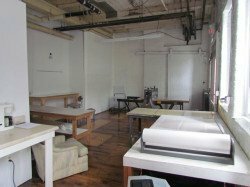 The Annex at Zea Mays Printmaking is a private editioning studio available for rental by members and visiting artists/printmakers. The Annex houses our large Takach etching press (42″ x 70″), has it’s own sink, three work tables and restroom access. Use of the Annex is on a daily or weekly basis. The renting artist/printmaker will be loaned a key to the private entrance of the Annex for the duration of the rental, so that s/he can access the Annex 24 hours per day during the rental period. The Annex is adjacent to the main studio at Zea Mays Printmaking. During the studio’s open hours, the door that separate the Annex from the main studio can be opened or closed, and tools from the main studio may be brought into the Annex for use. When the studio is closed, the door to the main studio will be locked, and the Annex can be accessed through the outside entrance. Rental of the Annex is open to current Zea Mays Printmaking members and to visiting artists/printmakers through our residency program. A security deposit will be required, as well as a signed contract for use of the space. The rental of the Annex includes 24 hour access and sole use of the large Takach etching press during the rental period.